Many know Vortex’ Diamondback riflescopes. However, there’s a new line-up which is the Diamondback HP series by Vortex. As you can imagine, HP stands for High Performance which is based on an array of features that you as a hunter will long for. The available magnification ranges provide a scope for nearly every situation from short-range to long-range shots. The main tube of the scope is designed as a single-piece and made from aircraft-grade aluminum with a diameter of 1 inch. The outside is hard-anodized with a matte black finish. This increases durability and ensures that the scope looks good even after years. As pretty much any high-end scope, these scopes provide superior water- and fog-proof capabilities. The scopes are purged with Argon, have o-ring seals and are designed to withstand shock. This combination provides superb targeting performance under most conditions. The optics consist of extra-low dispersion glass. This results in sharp and crisp images due to high color contrast and increased resolution. The multi-coated lenses are designed for optimal brightness. This allows you to be able to shoot even in low-light conditions. The adjustment knobs are easily accessible and allow to control the side focus and parallax. They are designed to allow the scope to be mounted at optimal height. The eyepiece focuses quickly and thus makes certain that the reticle is sharp and crisp. 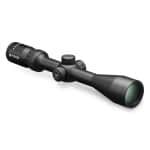 The Vortex Diamondback HP riflescopes are a great buy and provide many features that the modern shooter and hunter is looking for. Visit Vortex Optics for more information on Diamondback HP rifle scopes. Have a look at our other riflescope reviews and news.